« Day 441 In Beijing: The Spice Bazaar. Day 442 In Beijing: The Blue Mosque. 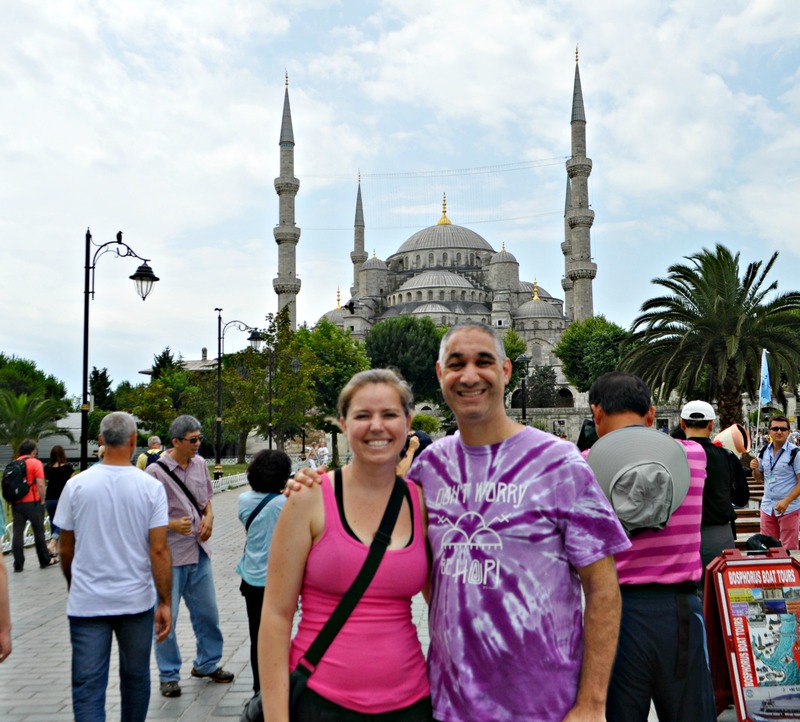 Jill and I wanted to see the Blue Mosque, since it was free, and we knew the other sites we wanted to see would cost money. The reason this matters is that we could buy a discount pass to see all the other sites but it is limited in regards to time (3 days total) and we didn’t want to start at this point since the lines were pretty long. We figured out that we’d see them, starting tomorrow morning, when there were less people and shorter lines. Also, July and August in this part of the world is incredibly hot so there aren’t as many tourists, which is nice, and the sites are usually less crowded. The negative is that some places are closed and others may have shorter viewing hours. We didn’t notice this on this trip but it has happened to us in other places. It is a chance we take to get away from the crowds and lines. To us, it is worth the trade-off. 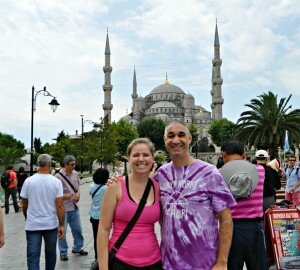 So, we walked up to the Blue Mosque and prepared to get in line. I had shorts on so I had to pull them down to below my knees (it is respect in the Muslim culture to have your knees covered if you are a man). Jill, on the other hand, has to put on a head scarf and also put on something covering her up down to her feet. This makes it incredibly hot and uncomfortable. To be honest, I’m not sure how women do it. I’ve been told that some don’t wear anything underneath their robes but most seemed to be wearing leggings, at the very least, and I could not imagine the heat and dehydration that would accompany such clothes. When we arrived, we realized it was in the middle of one of the prayer sessions and, as we aren’t Muslim, we wouldn’t be allowed inside. We decided to just take some pictures from the outside, grab some lunch, and then see what else we wanted to do. It was a bit anti-climatic to not be able to go inside but since Jill and I have been there before, it wasn’t a big let down. We knew we’d be seeing it in a day or so and wouldn’t have to rush. Isn’t that what a vacation is all about?